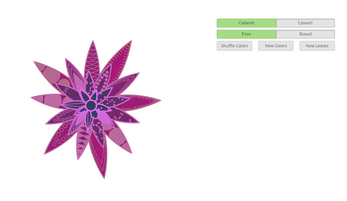 overflower is my current generator project. While Projcam I was on my holiday, so I could only work a little on it. You can choose between a colored flower or a lineart style. The lineart style can be used for pen plotters or other vector tracing machines like laser cutters. Additionally, you can choose between a complete flower or a boxed version, where the flower is placed in a rectangle. You can also shuffle colors current colors, get random new colors or get a random new shape. This is pretty nice and I don't think I've seen something like it before. Could be neat to arrange them into a flowerpot or something. This is lovely! I particularly love the designs you're creating inside the leaves.